In last Saturday’s win over Auburn, Ole Miss was able to consistently move the football downfield for points, and a big reason for that was the Rebels’ running game. With the 230-yard effort on the ground at home against Texas A&M, co-offensive coordinator/quarterbacks coach Dan Werner has put more emphasis on improving an Ole Miss’ running game that’s fifth in the Southeastern Conference in rushing yards (1,556) with 18 rushing touchdowns. The Rebels started the 2015 season against UT-Martin and Fresno State and rushed for 338 and 215 yards, respectively. But productivity on the ground dropped off dramatically in the win over Alabama (92 yards), and the losses to Florida (69 yards) and Memphis (40 yards). But as of late, Ole Miss has been showing more proficiency on the ground, and with three regular season games left and a SEC title berth in sight, Werner’s mindset of having a more-balanced offense could mean great things for the Rebels. “There’s no doubt,” Werner said when asked about the importance of the running game and its benefits. I’ve said it for years and everyone knows it, to be a really good football team, you have to run the football. I mean, if you think you’re going to throw for 500 yards a game and win in this conference consistently, you haven’t been around enough football. Thus far this season, No. 19 Ole Miss (7-2, 4-1) has used at least three running backs. However, until recently the Rebels’ lacked consistency on the ground and had to rely on Chad Kelly’s strong arm to move the offense. 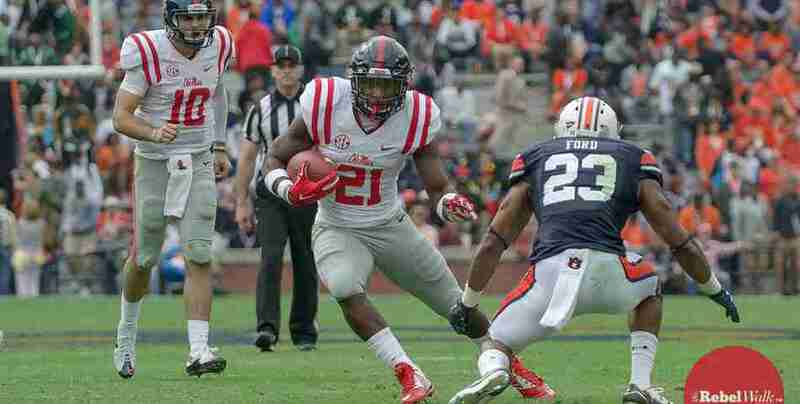 But now the Rebels have found solid success with a mixture of its power and speed running backs. Senior back Jaylen Walton has had most of the carry attempts (100) and leads the team in rushing yards (506). Walton has gotten a lot of his yards with his eye-blinking speed that enables him to break to the outside. Sophomore running back Jordan Wilkins, who has 250 yards on 58 carries, has the ability to run through the middle with his 6-foot-1, 214-pound body frame. Ole Miss is also seeing the emergence of junior Akeem Judd, who has rushed for 284 yards and three touchdowns on 50 carries this season. Like Wilkins, Judd has the frame to bounce off tackles or drag defenders with him for extra yardage. He’s averaging 5.7 yards per carry. Against the Tigers on the road, all three backs pounded the football deep into Auburn’s front seven which allowed Kelly to make easier passes. After the game head coach Hugh Freeze commented on his running backs, who notched a total of 156 rushing yards. “It definitely opened some things up for us, he said. “And with the return of Auburn’s Carl Lawson and their big talented players on the front, I thought we held our own and had some nice runs,” Freeze said. Ole Miss plays Arkansas at 2:30 pm (CT) in Oxford at Vaught-Hemingway Stadium this Saturday, November 7.